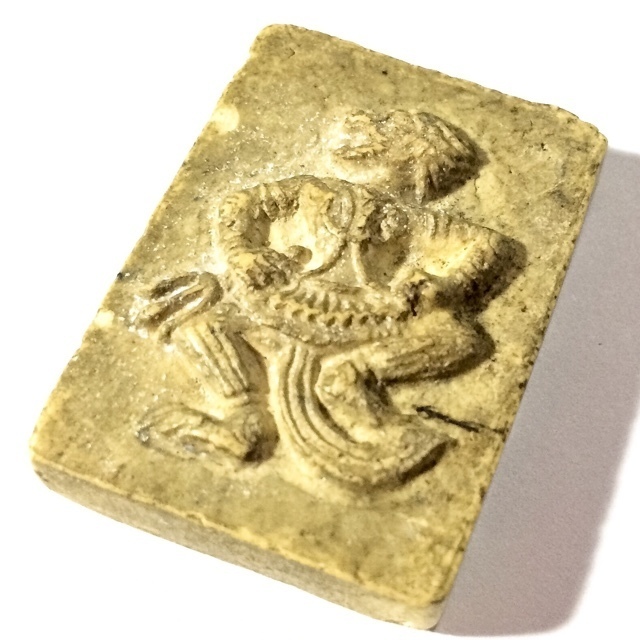 Hanuman Song Rit (Hanuman in Frenzy) is one of the rarer Pim (models) of the pantheon of amulets of the Great Luang Por Guay of Wat Kositaram. This particular exhibit is made from Nuea Pong Nam Man - Sacred Herbal and Flower Pollens with high quantity of consecrated oils added. Nuea Pong Nam Man is a very rich coarse Muan Sarn Sacred Powder, which lends a very hard and shiny texture to the surface of the amulet. Hanuman is the symbol of Loyalty, for his unwavering dedication and selfless service to Prince Rama as told in the Ramayana.